You can't move for good LP-inspired guitars around £600 at the moment. But the Standard is the best we've tried so far. Wonderful tones; the Vari-Coil; the clever forearm notch. We can't find anything to gripe about. The humbuckers on the Fret-King Eclat Standard are Trevor Wilkinson's own WVC models. The Eclat Standard is rather more than just another LP clone. The Eclat Standard's medium jumbo frets are finely dressed. Inspired by the classic single-cut that the late Lester Polsfuss held dear to his heart, Fret-King's Eclat Standard features a mahogany body with a carved maple top. Not groundbreaking, exactly, but look closer and you'll see it's the quality of the woods and construction that help the Eclat stand out from the crowd. The beautifully cut forearm notch slices through the guitar's top and shows us that we're dealing with solid maple here. "Those of you used to seeing maple tops supplemented with veneers should sit up and take notice: Fret-King mainman Trevor Wilkinson's choice of a plain-grain maple is a sight for sore eyes." Those of you used to seeing maple tops supplemented with veneers should sit up and take notice: Fret-King mainman Trevor Wilkinson's choice of a plain-grain maple is a sight for sore eyes. It actually gives the guitar a better-quality look than the usual heavily figured LP wannabes out there. The notch in the maple top isn't merely aesthetic, however - it's ergonomic, as boffins might say. It's strategically placed to accommodate your strumming arm and really does make resting your arm on the body more comfortable. Turning the Eclat over, you'll see that classic LP DNA has been further corrupted with a ribcage contour. But no matter your mid-section dimensions, you'll find this guitar comfortable to grapple with. Unlike its Fender-inspired brethren the Semitone and Corona SP, the Eclat has a glued-in mahogany neck. The profile is pleasantly chunky yet easily manageable, and its rosewood fingerboard and 22 medium jumbo frets have been rendered beautifully. In classic Les Paul style, the 'board has a 305mm (12-inch) radius. 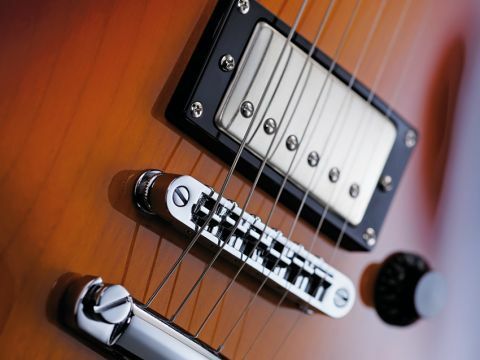 Wilkinson is fond of telling the tale of how humbucker pioneer Seth Lover entrusted him with the recipe for the perfect pickup: nickel silver covers and backing plate, the right size bobbins and Alnico V magnets. The proof is in the pudding, as ever, so we'll see just how well the two humbuckers loaded into the Eclat meet our tonal expectations. The Eclat offers a great range of single-coil and humbucking tones. Whatever Seth Lover passed on was worth its weight in tonal gold. We're also blown away by the Vari-Coil control. Sweeping through it shows just how subtle the difference between the tonality and output of single-coil and humbucking pickups can be. We like that a rolling coil-split control offers more sonic variation than a simple toggle switch. You might want to try this out: hit and sustain a note in the single-coil mode and gradually turn up the Vari-Coil to fatten the note as it begins to fade. It sounds great! The familiar outline and some of the construction techniques suggest Trevor Wilkinson didn't spend too much time at the drawing board to come up with the Eclat Standard. If that's what you're thinking though, then you're missing the point of this instrument. By focusing on playability, tonal versatility and quality of raw materials, construction and finish, Wilkinson has produced a guitar that punches way above its price tag.